The world is indeed a small place when at just 40,000 feet we fly above 75% of the Earth’s atmosphere. At a ground speed of 500 knots (926 kilometres per hour) we traverse half of the globe in just under one day. The following two cockpit photos were taken two days ago just to the west of Broome, Australia heading over the Indian Ocean on the way to Dubai. Underneath us lie continents, countries, economies, cultures, technologies and millions of wonderful people, families and loved ones. From the vantage of 40,000 feet it is clear that more things unite us on Earth than separate us. Etihad A340 “conning” at 42,000 feet. This second photo includes the light switches illuminated by the Annunciator light switch in test position. We sometimes use this switch position to ensure we identify the correct switch before selecting it during ECAM procedures and to also check that the lights work (though these are all highly reliable LEDs). Click here to download high resolution versions (7k x 4k) versions of these photos. These are free to use for your private use. For those who have enjoyed the images of Coplu’s wonderful paintings, here is a picture of my good friend taken last week in Sydney. I hope to show you more of his works in future blogs. Wherever you are on our small shared planet Earth – Coral, Coplu (who is spending summer in Sydney) and I wish you and your families a Merry Christmas, safe and happy holidays and a successful 2016. I hope you had a great christmas and a wonderful new year! Here’s to a great 2016! I have been reading your blog for a while, Its a huge inspiration to me ever since I heard your story. I am currently a trainee pilot at CAE Oxford Aviation academy here in the UK. I have only a few weeks left of ATPL ground school before continuing my flight training in Phoenix USA! We had a lesson today on Operational procedures which looked at fire, smoke and fire extinguishers and procedures. Remembering how QF32 turned out I had a query about something. Upon landing, I imagine it was quite a stop and the aircraft’s brakes must have been red hot! As the aircraft was leaking fuel from the port wing, fire crews sprayed foam under neath the aircraft (I hope i’m correct!) to stop any potential fires breaking out. My query was, did they wait until the brakes had cooled sufficiently (Or were they not hot enough anyway?) until they started spraying the foam? Surely if the foam hit the hot brakes and tires they could have exploded? Just a quick thought while processing today’s information! Anyway, have a great 2016! I look forward to many more posts! Great news about your training. Keep the hard work going and you will have a great career. I will write an enlightening blog in future about the firemen, engineer and police support we received that day. Click here to read more about the QF32 fuel situation. Thanks for getting back to me! Ah wow I didn’t realise they had to replace some of the runway! It sounds like everyone did a great job, really coordinated team effort! Thanks for letting me know! Many thanks for sharing the flight deck pics with us. It’s probably as close as the rest of us will ever get to seeing the real thing from now on! 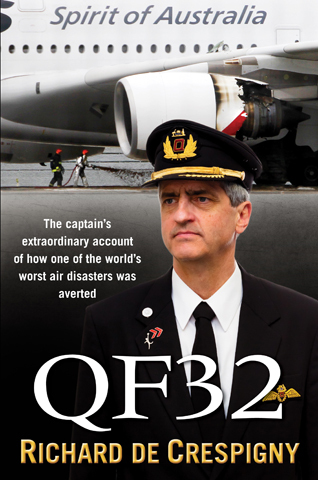 I’d also like to say thank you for an incredible read of the book QF32. You and the team obviously had your hands full for an extraordinarily long time, including the months and years that followed! I had the pleasure of flying home from the USA in an A380 in 2009, but even as a Gold Frequent Flyer, I haven’t had (made!) the opportunity again since. I still shake my head in awe when I wonder how 500 tonnes of plane makes it off the ground, and I often wave to what I think is QF94 arriving from LA when she flies quietly overhead on my walk to work. One small question: What are the antennas on the windscreens for? Thanks again and regards, Paul. One pair of wires deliver 115VAC (Essential AC Bus) power to the heating film in each window. Three pairs of wires provide 3 temperature sensor circuits for each window. The four pairs of wires connect to the Anti Ice Control Units (AICUs). QF9 – that used to go through Singapore didn’t it? I remember because I went on QF9 a few years ago on a 747-438(ER) from Melbourne to Singapore and then I think it may have been the same flight number from Singapore to London on an A380-842. I don’t think there is a much more confusing (and somewhat scary) experience than sitting at a huge, completely foreign airport with your 85 year old grandparents, next to your plane and wondering where your parents are when you are 10 years old and its 1:00 in the morning (it turned out my parents had gone off to the Qantas Club to charge their phones!). Merry Christmas to everyone (I know its a bit late now but whatever) and have a happy new year. To all those people who can’t stand fireworks, I know what you are going through. Sadly, we just have to find our earmuffs, earplugs and earphones (and an ipod with some good songs on it), put them all on and then run as fast as we can in the opposite direction to all the action. Fireworks are one of the major reasons that I want to be a pilot. But for now I must leave you all because I have some flights to look up! Thanks for the awesome Christmas greeting Rich! Best wishes to you and Coral and your family for 2016. Just re-read the QF32 story again. Just amazing and the other good part is that you’re still flying the A380. Got one back from Singapore recently and they are so nice to travel in. Hope you and your wife Coral have had a nice year. Do not forget to tell her about having to wear a raincoat when you fly Caribou’s in New Guinea. There is nothing more magical than receiving greetings from your – glorified – office. Thank you Captain. I wish that sometime you will be my Captain! VERY Merry Christmas to you, Coral, Sophia & Alexander. My best wishes from Cairo – Egypt. Keep Safe. There is nothing more magical than receiving a greetings from your – glory – office, Thank you Captain. I wish that sometime you will be my Captain! VERY Merry Christmas to you, Coral, Sophia & Alexander. My best wishes from here from Cairo – Egypt. Keep Safe. Merry Christmas to you and your entire crew. I know you are away from home (probably cold old London) for Christmas Day. Thanks for sharing this with us. Have a very happy Christmas. Have a great day! Same Tu you and your family. And Seasons Greeting to you and our family too. 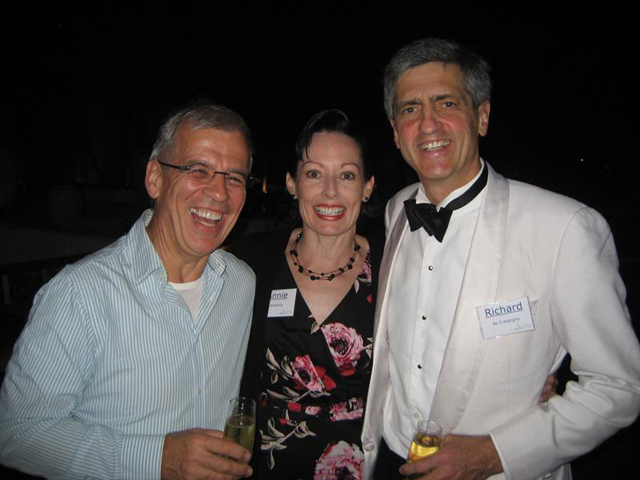 Merry Christmas to you, Coral and your family Richard. Merry Christmas Rich and family. Happy new year and happy landings to all of you. Keep safe as you always do. Merry Christmas Richard! I’m guessing you’re be in my part of the world (London) for Christmas… if so I hope you get to have a relaxed Christmas day spending time with others, rather be stuck in a hotel room near Heathrow? !